Muscular Dystrophy (MD) is a condition that is characterised by the loss of muscular strength and progressive muscle wasting or nerve deterioration. It is believed to be a hereditary condition for which there is (at present) no known cure. Some forms of MD can be detected in infancy whilst other signs may not manifest until adulthood. If your client has been diagnosed with MD then you will no doubt wish to help them to improve the quality of their life. Whilst this script does not promise to cure, it can help to re-frame the mind of an MD sufferer so that they are in a better position to cope with their issue. 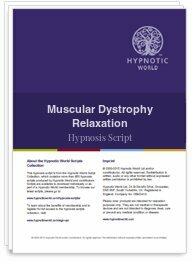 This Muscular Dystrophy hypnosis script from Hypnotic World aims to help clients to visualize tuning into the part of their mind that controls their automatic reactions.